Future Eruptions in California's Long Valley Area - What's Likely? Long Valley Caldera and the Mono-Inyo Craters chain form a large volcanic complex in eastern California that has had persistent earthquake activity and ground uplift in recent decades. Volcanoes have been active in the area for millions of years, and future eruptions are certain to occur. When the next eruption in the area does occur, it will most likely be small and from a site in the Mono-Inyo chain. The three Inyo Craters, part of the Mono-Inyo Craters volcanic chain, stretch northward across the floor of Long Valley Caldera, a large volcanic depression in eastern California. During the past 1,000 years there have been at least 12 volcanic eruptions along the chain, including those that formed the Inyo Craters and South Deadman Creek Dome (seen here just beyond the farthest Crater). After four strong (magnitude 6) earthquakes rocked the Long Valley area of eastern California in May 1980, U.S. Geological Survey (USGS) scientists also detected evidence of renewed volcanic unrest in the region. They discovered that the central part of Long Valley Caldera, a broad depression formed in a cataclysmic volcanic eruption 760,000 years ago, was slowly rising. Because such ground deformation and earthquakes are common precursors of volcanic eruptions, the USGS has continued to closely monitor the unrest in this region. It is natural to wonder when and where the next volcanic eruption might occur in the Long Valley area. Geologic processes generally proceed at a slow pace, and when viewed on the scale of a human lifetime, volcanic eruptions and destructive earthquakes happen rarely. Nevertheless, the long history of volcanic activity in the Long Valley area indicates that future eruptions will occur. Geologists studying the Long Valley Caldera have found that following its creation in the violent eruption 760,000 years ago, clusters of smaller volcanic eruptions have occurred in the caldera at roughly 200,000-year intervals. About 100,000 years ago, the most recent of these eruptions formed the Mammoth Knolls, low hills just north of the Town of Mammoth Lakes. Mammoth Mountain, a young volcano on the rim of Long Valley Caldera, was built by numerous eruptions between 220,000 and 50,000 years ago. Volcanoes in the Mono-Inyo Craters volcanic chain, which extends from just south of Mammoth Mountain to the north shore of Mono Lake, have erupted often over the past 40,000 years. During the last 5,000 years, an eruption has broken out somewhere along this chain every 250 to 700 years. The Inyo Craters and nearby lava domes were formed by a series of small to moderate eruptions 550 to 600 years ago, and the most recent eruptions along the volcanic chain took place about 250 years ago at Paoha Island in Mono Lake. The pattern of volcanic activity over the past 5,000 years suggests that the next eruption in the Long Valley area will most likely happen somewhere along the Mono-Inyo volcanic chain. However, the probability of such an eruption occurring in any given year is less than 1%. This is comparable to the annual chance of a magnitude 8 earthquake (like the Great 1906 San Francisco Earthquake) along the San Andreas Fault in coastal California or of an eruption from one of the more active Cascade Range volcanoes in the Pacific Northwest, such as Mount Rainier. As long as increased volcanic unrest (including earthquake swarms, ground deformation, and CO2 gas emissions) continues in the Long Valley area, the chances of an eruption occurring in the near future will remain somewhat increased. However, evidence from large volcanic areas and calderas worldwide shows that unrest, such as the current activity in eastern California, can persist for decades or even centuries without leading to an eruption. Nevertheless, recent eruptions at Rabaul Caldera in Papua New Guinea (1994) and the Izu volcanic complex in Japan (1989) following short periods of unrest emphasize the need to closely monitor restless calderas. When an eruption does break out in the Long Valley area, its impact will depend on the location, size, and type of eruption, as well as the wind direction. Also, an eruption during the winter months could melt heavy snow packs, generating mudflows and locally destructive flooding. Most likely, the next eruption will be small and similar to previous eruptions along the Mono-Inyo volcanic chain during the past 5,000 years. Such eruptions typically begin with a series of steam-blast explosions as rising molten rock (magma) encounters and vaporizes underground water near the Earth's surface. These blasts can throw large blocks of rock and smaller fragments hundreds of feet into the air, leaving deep, circular pits like the Inyo Craters. If magma reaches the surface, gases trapped within it can escape explosively, hurling volcanic ash (tiny fragments of the solidifying magma) as high as 6 miles or more. Airborne volcanic ash can be carried hundreds of miles downwind, and the amount and size of falling ash decrease with distance from the eruption site. Thin accumulations of ash pose little threat to life or property, especially in areas where the roofs of most buildings are constructed to withstand heavy snow loads. However, even a light dusting of fine volcanic ash can close roads and seriously disrupt communications and utilities for weeks or months after an eruption. The eruptions that led to the creation of the 600-year-old South Deadman Creek Dome covered the area of what is now the Town of Mammoth Lakes with a layer of volcanic ash about 1 inch thick. During these eruptions, the wind first blew toward the northeast (tan) and later toward the southwest (pink), spreading volcanic ash in the pattern shown on the map. These eruptions also produced fiery flows of hot ash (pyroclastic flows). Depending on the wind direction and the location of an eruption site, future eruptions in the Long Valley area could spread volcanic ash over the communities of Mammoth Lakes, June Lake, or Lee Vining (see also eruption chart). Pyroclastic flows incicated by yellow and orange area. Explosive volcanic eruptions may also produce fiery flows of hot ash (pyroclastic flows) that can sweep over the ground at speeds greater than 100 miles an hour, devastating everything in their paths. In the past 5,000 years, eruptions from several sites along the Mono-Inyo chain have produced narrow, tongue-like pyroclastic flows that extended more than 5 miles. Fortunately, the main population centers in the Long Valley area are far enough from probable eruption sites that they are unlikely to be directly impacted by future pyroclastic flows. Less violent eruptions have also taken place in the Long Valley area. These eruptions typically began with mild explosions that formed relatively small volcanic cones less than 1,000 feet in diameter and then produced hot, fluid lava flows that extended a few miles. Eruptions of this type about 5,000 years ago created the Red Cones, just south of Mammoth Mountain. 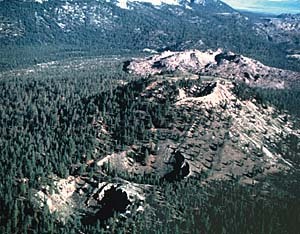 Flows of fluid lava were also erupted from sites near the base of Mammoth Mountain between 400,000 and 60,000 years ago. Such flows are highly destructive to property, but seldom endanger people because lava flows rarely move faster than a brisk walk. Although the chance of a volcanic eruption in any given year is small, future eruptions will occur in the Long Valley area. Because volcanic unrest can escalate to an eruption in a few weeks or less, USGS scientists are closely monitoring activity in this region. To be able to provide the public with reliable and timely warnings before an eruption, the USGS has joined local and State authorities in developing procedures for responding to changing levels of volcanic unrest in the Long Valley area. The ongoing work of the USGS Volcano Hazards Program in this and other volcanic regions of the United States helps to better protect people's lives and property from volcano hazards.